The Belfast Telegraph writer Declan Bogue says he doesn’t know why the Donegal boss felt ‘degraded’ by his book. 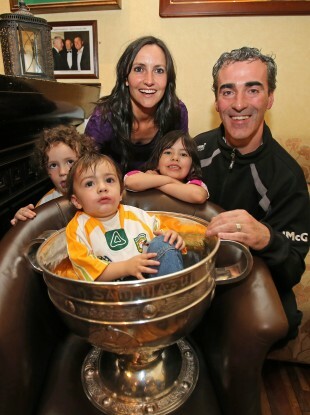 Manager Jim McGuinness with his family, wife Yvonne, and kids Toni-Marie, Michael Anthony and Jim Jr in the Sam Maguire Cup. THE GAA JOURNALIST who was ejected from the post All-Ireland SFC final press conference by Jim McGuinness, says he’d be happy to talk through any issues with the Donegal manager. McGuinness said ‘inaccuracies’ that he says appeared in Bogue’s book ‘This Is Our Year’ were behind his decision to ban the writer on Sunday afternoon. He refused to speak to the written press in Croke Park until after the author had left the room. Bogue’s book, which featured former Donegal defender Kevin Cassidy, led to the controversial end of the Gweedore man’s inter-county career last November. “I wasn’t upset. Upset’s probably a strange enough word to use. No, I wouldn’t have said I was upset now,” Bogue told Today FM’s The Last Word this evening. This evening he says he’d happily discuss the book’s contents with McGuinness. “It’s a first person narrative of everyone’s version of what’s happening in their own lives,” Bogue told Matt Cooper. “In terms of research how could you research it only by asking other Donegal players their version — and that’s putting their position at risk too. I did work with an editor and he would have advised me on certain things so we would’ve been very tight on our research. He continued: “I’ve been getting an awful lot of feedback through text messages and Twitter and everything else and people are telling me the book is relentlessly positive, it’s a glowing endorsement of the management of Donegal. Kevin Cassidy says at one stage in the book that he’d run through walls for the guy. All I heard throughout the year was that this is just so positive and he’s such a great influence on everyone. “I have absolutely nothing against the man and would speak to him if he wished. If there was an upset and he didn’t want to make it public — which he obviously doesn’t — a conversation or meeting would be of no bother to me. Email “'I have nothing against Jim McGuinness' says banned journalist”. Feedback on “'I have nothing against Jim McGuinness' says banned journalist”.